Everyone saw Kobe Bryant go down… it was brutal to watch. He felt a pop as his achilles tendon ruptured. A rough injury, although this tendon is injured more than any other. So, why doesn’t it get more attention? The achilles tendon is just below your calf, where it meets the back of your foot. It is actually the strongest and thickest tendon in the body, although it is still the most common injury, so something must be going wrong. Well, the injury itself is caused by plantarflexion or dorsiflexion (when you take off or plant your foot). That’s a normal movement you make thousands of times a day, but too much force, twisting or simple, muscle exhaustion are the main leading cause of injury to this tendon. And the injury is serious. It usually takes anywhere from 6 months to a year to heal. The average age of the person who experiences an Achilles tear is 29-40 and it is usually twenty to one, men to women. Obviously, the more serious the injury, the more serious the treatment. Although most people will get surgery, four different studies found small but important benefits from the surgery. For example, they found 4% re-rupture after surgery as compared to 12% for those who elect not get surgery. That is still a fairly large difference in my book, though. Also, those who elect to have surgery find better results in the heel-rise work, heel-rise height, concentric power, and hopping tests. So, if you have a ruptured achilles tendon, I do recommend considering surgery as a good option and obviously, speak to your doctor right away. The main thing to consider is how to help prevent achilles injuries and how to rehab them after surgery. First, protection… The stronger and more mobile you help make your achilles tendon, the better you will be protected from injury. And obviously, spending a little time before you exercise to stretch and work your ankles, calves and achilles tendons are well worth it. 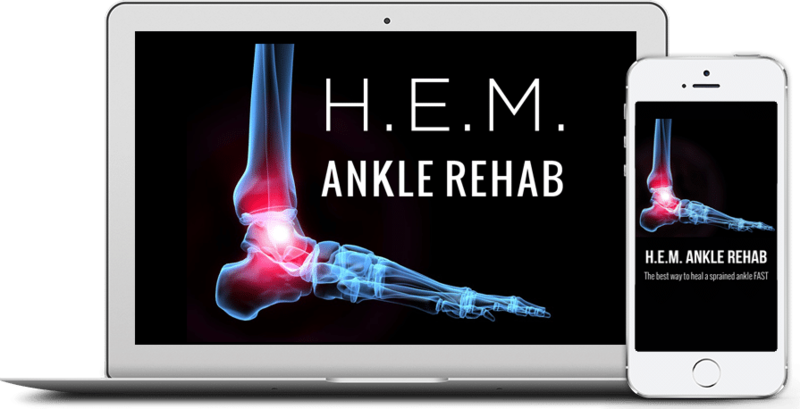 Check out HEM Ankle Rehab for a full Prehab program that will help increase range of motion and strength in the achilles tendon. Now, if you are ready for rehab, because you already had an achilles tendon injury, H.E.M. can also be very helpful. You really need to improve range of motion and strength in the whole lower body. So, you should also be focusing on the hips, knees and calves, because chances are very good that your muscles have atrophied significantly. And the last thing you want is to get back to activity and get a knee injury, because you forgot about strengthening the rest of your body. The main thing is to take it slow and really rehabilitate yourself properly. Hopefully, you are in a position to protect yourself from injury, but if not, take the long road to recovery to help get back to 100% and protect yourself in the future.